Since its creation in 2005, the United Nations (UN) Peacebuilding Architecture (PBA) has scored some successes in terms of increasing opportunities for financing of peacebuilding efforts and working with governments in this area. 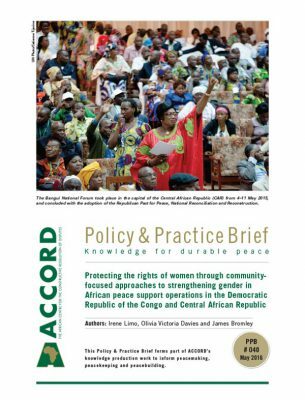 However, the broad view by many in the peacebuilding community is that the PBA has failed to live up to its mandate and the expectations peacebuilding actors had of it when it was endorsed at the 2005 World Summit.3 This Policy & Practice Brief (PPB) discusses the rationale behind the creation of the PBA, the gaps it aimed to fill, and where the body has veered off track in the course of carrying out its mandate over the past 10 years. The brief concludes by advancing recommendations to various sectors in the peacebuilding community for the adaptation and advancement of post-conflict recovery efforts going forward. It notes that generally, the PBA has struggled to meet the needs of local-level stakeholders in the 10 years of its operations. In 2015, there are opportunities for the body to resolve some gaps between what actors expect and receive through enhancing communication with all stakeholders. This process would be the precursor to reforming the mandate of the PBA to meet the growing needs of post-conflict communities and enhancing its capacity. From the mid- to late-1990s, several international agencies created special units to address post-conflict reconstruction needs. These included the Organisation for Economic Cooperation and Development (OECD)’s Conflict Prevention and Post-Conflict Reconstruction Network which aimed to help better coordinate aid agencies’ peacebuilding activities in 1997. That same year, the World Bank adopted a framework for its involvement in post-conflict reconstruction and established the Post-Conflict Fund to ensure faster loans and grants to conflict-affected countries. In Africa, the New Partnership for Africa’s Development (NEPAD) and the AU separately developed post-conflict reconstruction frameworks in June 2005 and July 2006 respectively, while in 2005 the PBA was established, providing what was widely regarded as the official peacebuilding body of the UN. In May 2007, the UN Secretary-General’s Policy Committee agreed on a conceptual understanding of peacebuilding to inform UN practice. They settled on a definition of peacebuilding as involving ‘a range of measures targeted to reduce the risk of lapsing or relapsing into conflict by strengthening national capacities at all levels for conflict management, and to lay the foundations for sustainable peace and development.’11 Expanding the definition resulted in an increase in the number of actors and institutions carrying out peacebuilding work. What is the Peacebuilding Architecture and why was it created? The creation of the UN in 1945 was in response to prevailing threats to international security. As the years passed the challenges facing the world changed, necessitating global adaptation to deal with the new dynamics, among them the intra-state conflicts that characterised the post-Cold War period. This new type of conflict rarely ended in decisive military victory, nor did it result in a well-delineated post-conflict reconstruction phase. Rather, the common outcome was very fragile countries with extremely high risks of returning to violence.12 The need for new mechanisms and approaches to address these challenges was evident. The panel recommended the establishment of a ‘single intergovernmental organ dedicated to peacebuilding, empowered to monitor and pay close attention to countries at risk, ensure concerted action by donors, agencies, programmes and financial institutions, and mobilise financial resources for sustainable peace.’15 In response, the PBC was established as an intergovernmental advisory body by corresponding resolutions of the UNGA and UNSC. The PBC’s start-up was slow, but by September 2006 the first two countries on its agenda – Burundi and Sierra Leone – had been adopted and the announcement of the first allocation of funds to these countries made. One year later, in December 2007, Guinea-Bissau was added, followed by Central African Republic (CAR) in May 2008, Liberia in October 2010 and Guinea in February 2011. Reasons for successes or failures in the different countries vary. The sections below outline common challenges facing the PBA and provide some suggestions for the peacebuilding community going forward. The international community needs to move beyond planning for post-conflict contexts, to focusing on continuous engagement in conflict prevention and political transformation. In the meantime though, contemporary tools with which to mitigate conflicts and developmental approaches to address root causes and lay foundations for sustainable peace are needed. Actors would also do well to integrate development, conflict management and trauma-healing approaches into peacebuilding. If the PBF is to effectively carry out its mandate, it needs to broaden its funding approach and be more flexible. Consideration should be given to funding civil society organisations and local initiatives, and not only directing funding through UN programmes. This approach would also ensure better accountability for funds as well as improved sustainability. Further, any UN funding must be supplemented by national systems to ensure local involvement, buy-in and responsibility for the initiative. Lastly, the funding community needs to be grown, and efforts to source longer-term financing options extended and better coordinated. Despite a common understanding of what is meant by effective coherence, it is not always easily attainable in practice. 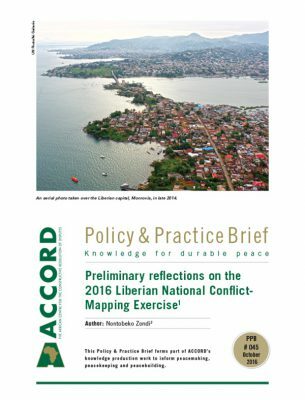 The ‘coherence dilemma’ is well known in the peacebuilding policy and research community. It refers to the argument that peacebuilding missions will be more efficient, and thus have a more meaningful impact, when the different peacebuilding agents involved have a common objective.41 This is based on the shared understanding that lack of coherence is a critical shortcoming of peacebuilding interventions and, thus, improving coherence would lead to greater efficiency and effectiveness. This line of thinking is evident in the UN’s move towards integrated missions and the ‘Delivering as One’ initiative. Yet, even with these changes, empirical cases show what appear to be persistent and intrinsic limitations to the degree to which coherence is attainable in peacebuilding systems, thus the dilemma.42 Responses to this quandary would typically involve enhancing policies and frameworks which would promote greater coherence and, as a result, more succinct peacebuilding interventions.43 Practically, however, in spite of the best efforts of peacebuilding practitioners over many years to test various approaches, models and tools to achieve optimal levels of coherence, it remains an elusive goal. The PBC, if it engaged more strategically with national counterparts and UN personnel on the ground, could draw a range of actors, including IFIs, local organisations, international actors and governments to work together in implementing national strategies. Sierra Leone, and the PBC’s ability to unite all UN actors behind the government’s national peacebuilding strategy there, is often cited as a model for PBC engagement worthy of replication in future cases.44 Despite this, however, the PBC’s ability to drive coordination among international actors has been limited. If the PBA is to achieve its mandate of bringing together all relevant actors to ensure integrated strategies on peacebuilding for sustainable development, working together in a more transparent and coordinated manner will go a long way towards ensuring clearer understanding of peacebuilding by those involved. Strategically, the most important regional relationship for the UN is with the AU. African capacities are an important resource for UN peacekeeping, currently contributing approximately 45 per cent of the UN’s uniformed personnel.48 Further, the AU is able to deploy much faster to post-conflict situations than the UN, due to standby brigades at the level of the regional economic communities (RECs) which are able to provide forces towards AU missions.50 The support of the UN is a critical enabler for AU operations, providing political support and legitimacy, and the UN is an important exit strategy partner of the AU.49 The question should not be which institution to engage with, but how to work with both towards a common goal. The UN/AU Hybrid Operation in Darfur is a good example of the two institutions working together to stabilise a situation. However, past experiences of UN/AU collaboration have not always been positive, with insufficient coherence in decisions taken and support for each other. In many instances, while the AU called for ‘African leadership’ rather than external intervention, the UN criticised AU member states’ lack of initiative in implementing their own agendas. This was the situation in Liberia when the country and other African actors sought to focus on transitional justice processes, while the UN funded other programmes.51 Another example is the AU’s refusal to follow the UN and support the International Criminal Court (ICC)’s indictment of Sudanese President Omar al-Bashir on 3 July 2009.52 This move could be perceived as a protest in response to the perception that the ICC only targets African countries, or as one aimed at showing independence from the UN. Regardless, it appears there is an imbalance of power between these two multilateral organisations which should be rectified to support enhanced coherence in post-conflict interventions. Further, it is important to align the AU Post-Conflict Reconstruction and Development (PCRD) policy and the UN PBA in order to prioritise and tackle the same issues on the continent. Also crucial is a supportive environment, as well as shared commitment to upholding the same mandate among actors.54 As mentioned above, there have been times, especially on issues of international justice, where the two bodies have opposed each other. Strategically, the UN and AU need to foster a common narrative that is mutually reinforcing and respectful of each other’s roles. Operationally, the two should work on developing mechanisms to ensure the provision of strategic guidance and joint guidelines on transitions, so that it becomes easier for both organisations to involve each other from the earliest stages in assessments, planning, coordination mechanisms, mission support, benchmarks and evaluation.55 The Joint UN-AU Framework for an Enhanced Partnership in Peace and Security,56 signed by the AU Department for Peace and Security and the UN Office to the AU in March 2014, and the Common African Position on the UN Review of Peace Operations,57 released in April 2015, should be used as the basis for this improved relationship. Both documents contain resolutions and commitments for an improved working relationship and cooperation at all levels, which would vastly improve peacebuilding missions on the continent. The peacebuilding community should uphold commitments made in the Common African Position on the UN Review of Peace Operations, which promotes the idea of improved coherence and coordination between the UN and AU. Some of these commitments include more meetings between the PBC and relevant components and organs of the African Union Commission (AUC) to unpack priorities and promote cooperation. Transparency should be encouraged, and regular desk-to-desk exchanges and joint initiatives prioritised. Civil society should be understood to include the private sector, international NGOs as well as local level initiatives. Better coordination between international actors, the UN, and civil society can be achieved through improved interactions between civil society and regional organisations. The PBC should initiate annual meetings with these groups, which would ensure that the PBC can live up to the objective set out in UNSC Resolution 60/18063 to engage directly with civil society. As we enter the third phase of the PBA, it is important for the international community to evaluate how it should continue if it is to be more effective in existing and future conflict situations. The recommendations below are not exhaustive, and the onus lies on the peacebuilding community to enhance both the PBA and peacebuilding practice as a whole for effective post-conflict interventions. The mandate of the PBA and the expectations those in the peacebuilding community have of it need to be clarified. This can be done by reaffirming its obligations, and effectively managing communication from the PBA’s organs to the wider public and stakeholders. Alternatively, the mandate of the PBA needs to be redefined so it better responds to needs on the ground. Better coherence and coordination are needed between local and international actors, as well as between international actors, and even within the UN itself. Review of the situation could be carried out, focusing on the operational modalities of the PBA. Emphasis should be placed on examining how the PBA relates with the UNSC. Evaluating internal coherence at the UN would be the first step towards aligning decision-making within the entity’s various structures. The PBF needs to broaden its approach to funding and become more flexible in its resource mobilisation efforts. Whilst it is acknowledged that the PBF takes more risks by financing projects that traditional donors would not, it is still important to align its reporting frameworks so they are more adaptable to situations on the ground. The PBF should also consider funding civil society organisation and local initiatives, and not only channelling funding through UN programmes as this will allow for more direct accountability for funds, as well as enhanced sustainability of local projects. Any funding from the UN must be supplemented by national systems to ensure greater local involvement and buy-in, as well as accountability and efforts to prevent corrupt practices. There should be more meetings between the PBC and AUC to promote coherence around strategic priorities for peacebuilding in Africa. These should include desk-to-desk meetings in the field, as well as at the highest levels, as per commitments made in the Common African Position on the UN Review of Peace Operations and Joint UN-AU Framework for an Enhanced Partnership in Peace and Security. The PBC should commission periodic peacebuilding audits that assess progress in specific countries towards meeting medium- to long-term strategic goals, so as to involve all actors and ensure international and regional attention to addressing root causes of conflict (international, regional, national and local). More investment is needed by those involved for a more comprehensive understanding of the fundamental dynamics of a conflict. Particular attention should be paid to the economics of a conflict, and to the underlying politics fuelling tensions. Enhanced coherence and cooperation among donors to allow for greater transparency in projects and ensure long-term and sustainable funding for activities is also important. The notion of who to engage with in post-conflict situations should be expanded beyond just civil society to include the private sector, international NGOs and local initiatives. This will ensure that all actors working on post-conflict development are involved, thus enhancing the potential for more strategic approaches. Individual peacebuilding efforts need to be integrated in the quest to stabilise countries emerging from conflict. UN interventions need to take a ‘whole of system’ approach, with political, protection and assistance projects supporting their activities, as well as working with local actors to stabilise the situation. The AU should make efforts to uphold commitments made in the Common African Position on the UN Review of Peace Operations to work with the UN in a more integrated fashion and on an equal footing. In addition, civil society and other peacebuilding actors should be given the power to hold those involved accountable to these resolutions and ensure follow-through. Overall, it is clear that there is a challenge with the mandate of the PBA. The PBA which exists now is certainly not the body that was envisioned. Compromises were made in its creation and over time it has shaped up differently. Despite this, the PBA has had some successes in establishing in-country programmes and working with national governments to ensure sustainable post-conflict development. However, by and large it would seem that the PBA has struggled to meet the needs of actors on the ground. The year 2015 offers the international community the opportunity to reflect on whether the PBA should continue as it is, or take a new form. Going forward there are three options: the PBA can maintain the status quo and continue working with the challenges it has, hoping perhaps for minor impacts; it can clarify stakeholders’ expectations of it and effectively communicate its mandate and niche to resolve some gaps between what actors expect and receive. In its turn, the international peacebuilding community can consider reforming the mandate and capacity of the PBA to meet the growing needs of post-conflict communities. As we await the outcome of the Advisory Group of Experts’ report on the review of the PBA, what definitely needs to be decided is how recommendations made will be operationalised in the peacebuilding field to ensure that at the next review, we are not discussing the same challenges and gaps in implementation. The author extends her appreciation to Senzo Ngubane, Dr Cedric de Coning, John Ahere and Dr Andreas Velthuizen for adding value to this brief through sharing their comments and constructive feedback on earlier drafts. She would also like to thank Petronella Mugoni for her support, edits and substantive contribution to this publication. Without the support of this team, the paper would be a shadow of what it is now. United Nations. 2010. United Nations General Assembly resolution A/64/868 – S/2010/393. United Nations. Available from: <http://www.un.org/en/peacebuilding/review2010.shtml> [Accessed 15 May 2015]. Hearn, S. Bujones, A.K., Kugel, A. 2014. The United Nations ‘Peacebuilding Architecture’: Past, present and future. New York University Centre for International Cooperation. New York, New York University Centre for International Cooperation. 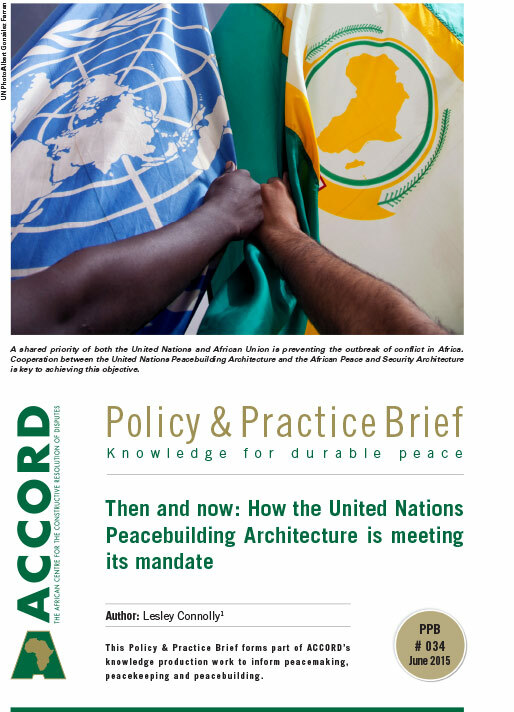 Available from <http://cic.nyu.edu/sites/default/files/un_peace_architecture.pdf> [Accessed 27 May 2015]. Refers to the five permanent members of the UNSC: China, France, Russia, the United Kingdom, and the United States of America. United Nations. 2004. Agenda item 55: Follow-up to the outcome of the Millennium Summit. Note by the Secretary-General. United Nations. p. 69. Available from: <http://www.un.org/Docs/journal/asp/ws.asp?m=A/RES/60/180> [Accessed 17 May 2015]. United Nations. 1992. An agenda for peace: Preventive diplomacy, peacemaking and peacekeeping. Report of the Secretary-General pursuant to the statement adopted by the summit meeting of the Security Council on 31 January 1992. United Nations, Article 21. Available from: <http://www.unrol.org/files/a_47_277.pdf> [Accessed 17 May 2015]. United Nations. 2000. Item 87 of the provisional agenda: Comprehensive review of the whole question of peacekeeping operations in all their aspects. United Nations. p. 61. Available from <http://www.un.org/en/ga/search/view_doc.asp?symbol=A/55/305> [Accessed 27 May 2015]. Chandran, R. 2015. Conceptual issues in peacebuilding. United Nations University Centre for Policy Research. Tokyo, United Nations University Centre for Policy Research. 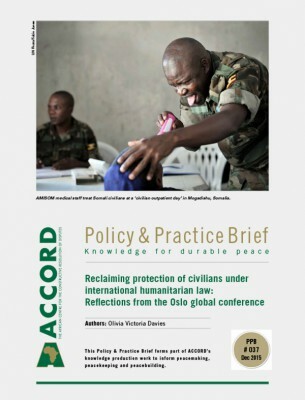 Available from: <http://i.unu.edu/media/cpr.unu.edu/attachment/1003/Conceptual-Issues-In-Peacebuilding.pdf> [Accessed 17 May 2015]. United Nations Peacebuilding Support Office. 2010. UN Peacebuilding: An Orientation, September, United Nations Peacebuilding Support Office. p. 5. Available from: <http://www.un.org/en/peacebuilding/pbso/pdf/peacebuilding_orientation.pdf> [Accessed 11 June 2015]. Hearn, S. Bujones, A.K., Kugel, A. 2014. Op. cit. United Nations. 2004. Agenda item 55: Follow-up to the outcome of the Millennium Summit. United Nations. p. 1. Available from: <http://www.unrol.org/files/gaA.59.565_En.pdf> [Accessed 17 May 2015]. Wyeth, V. no date. Peacebuilding over the last 10 years. FriEnt: Working Group on Peace and Development. 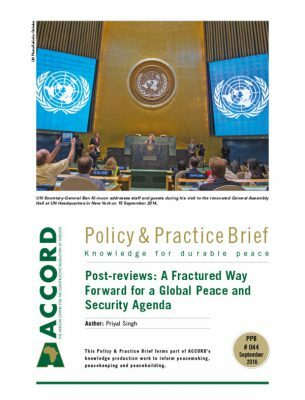 Available from: <http://www.frient.de/en/publications-service/news-details/article/peacebuilding-at-the-un-over-the-last-10-years.html> [Accessed 21 May 2015]. United Nations. 2004. Op. cit. p. 61. Wyeth, V. no date. Op. cit. United Nations. 2004. Op. cit. Tschirgi, N. and de Coning, C. 2015. Ensuring sustainable peace: Strengthening global security and justice through the UN Peacebuilding Architecture. Commission on Global Security, Justice and Governance. Slotin, J. 2009. Perspectives on the Peacebuilding Commission’s coordination role. International Peace Institute. 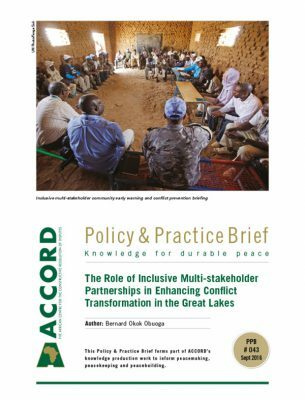 Available from: <http://www.betterpeace.org/files/IPI_Issue_Brief_Perspectives_on_the_PBCs_Coordination_Role_Nov2009.pdf> [Accessed 1 June 2015]. This point was taken from the contributions of participants attending a conference on the theme ‘Regional Dimensions of Peacebuilding: A Review of the impacts of the United Nations Peacebuilding Architecture in the Horn and East Africa Region’ held in Addis Ababa on 11 and 12 May 2015. The event was hosted by the African Centre for the Constructive Resolution of Disputes. Tschirgi, N. and de Coning, C. 2015. Op. cit. Call, C. 2015. The evolution of peacebuilding: Improved ideas and institutions. United Nations University Centre for Policy Research. Tokyo, United Nations University Centre for Policy Research. Available from: <http://i.unu.edu/media/cpr.unu.edu/attachment/1001/The-Evolution-of-Peacebuilding-Improved-Ideas-and-Institutions.pdf> [Accessed 1 June 2015]. United Nations Peacebuilding Fund. no date. How we fund. United Nations Peacebuilding Fund. Available from: <http://www.unpbf.org/how-we-fund/> [Accessed 3 June 2015]. Call, C. 2015. Op. cit. Barungi, B. and Davies, V. 2010. African Development Bank’s experience in fragile states. Policy brief on fragile states 1/2010. African Development Bank. 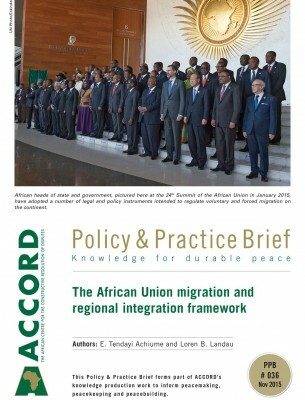 Available from: <http://www.afdb.org/fileadmin/uploads/afdb/Documents/Publications/Policy%20Brief%20on%20Fragile%20States%20No%201_Barungi-Davies%20%2025%20May%20_LN_cleared.pdf> [Accessed 1 June 2015]. De Coning, C. 2010. Clarity, coherence and context: Three priorities for sustainable peacebuilding. Working paper: The future of the peacebuilding architecture project. Norwegian Institute of International Affairs and University of Ottawa Centre for International Policy Studies. Ottawa, Norwegian Institute of International Affairs and University of Ottawa Centre for International Policy Studies. p. 20. Available from: <http://www.academia.edu/1902351/Clarity_Coherence_and_Context_Three_Priorities_for_Sustainable_Peacebuilding> [Accessed 1 June 2015]. De Coning, C. 2012. Coherence and international cooperation: A complexity theory approach to the coordination dilemma in peacebuilding operations. PhD thesis. Stellenbosch, University of Stellenbosch. Smith, D. 2004. Towards a strategic framework for peacebuilding: The synthesis report of the joint Utstein study on peacebuilding. International Peace Research Institute. Oslo, International Peace Research Institute. Campbell, S. 2015. What Burundi’s crisis says about UN capacity to build peace. The Washington Post, 18 May. 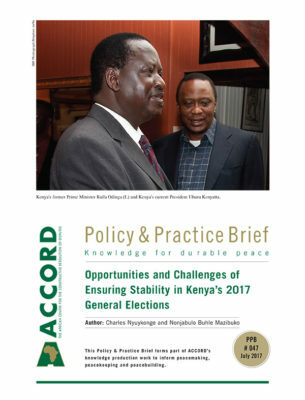 Available from: <http://www.washingtonpost.com/blogs/monkey-cage/wp/2015/05/18/what-burundis-crisis-says-about-un-capacity-to-build-peace/> [Accessed 20 May 2015]. Chandran, R. 2015. Op. cit. De Coning, C. 2015. Regional and local approaches to peacebuilding. African Centre for the Constructive Resolution of Disputes blog, April. 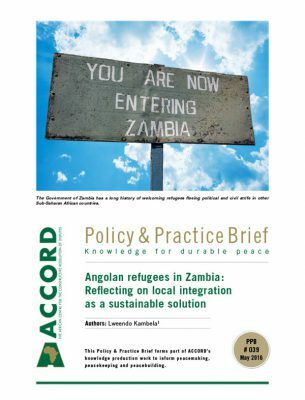 Available from: <http://www.accord.org.za/blog/regional-and-local-approaches-to-peacebuilding/> [Accessed 10 May 2015]. Institute for Security Studies. 2007. 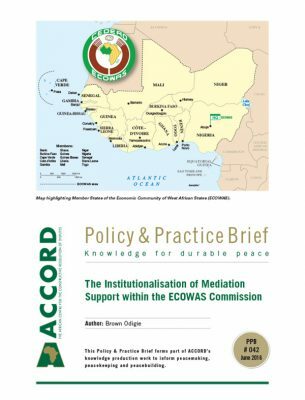 A discussion think piece: The AU/UN Hybrid Operation in Darfur: Challenges, lessons and implications for regional peacekeeping training, Paper presented at the SADC workshop on peace support operations, 3–5 November, in Harare, Zimbabwe. Available from: <http://www.issafrica.org/uploads/DARFURFESTUS.PDF> [Accessed 10 May 2015]. De Coning, C, 2015. Regional approaches to peacebuilding. United Nations University Centre for Policy Research. Tokyo, United Nations University Centre for Policy Research. 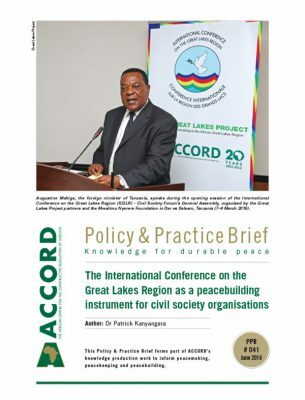 Available from: <http://i.unu.edu/media/cpr.unu.edu/attachment/1007/Regional-Approaches-to-Peacebuilding.pdf> [Accessed 10 May 2015]. African Centre for the Constructive Resolution of Disputes. 2014. Towards a more coherent peacebuilding policy community seminar: Proceedings on 19 and 20 February in Johannesburg, South Africa. Video recording. 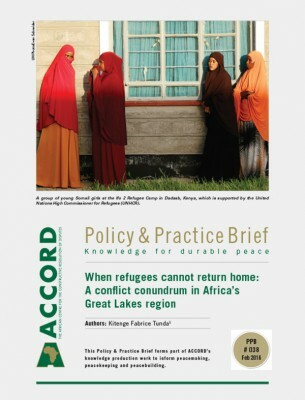 Available from: <http://www.accord.org.za/peacebuilding-multimedia/> [Accessed 23 April 2014]. Tladi, D. 2012. The African Union and the International Criminal Court: The battle for the soul of international law. Councilandcourt.org. Available from: <http://councilandcourt.org/files/2012/11/Tladi-AU-and-ICC.pdf> [Accessed 26 May 2015]. De Coning, C. 2015. Will the high-level independent panel manage to revitalise a new generation of UN peace operations? Unpublished. De Coning, C, 2015. Regional approaches to peacebuilding. United Nations University Centre for Policy Research. Op. cit. For more information see United Nations Security Council. Letter dated 8 December 2014 from the Permanent Representative of Chad to the United Nations addressed to the Secretary-General, S.2014/879. United Nations Security Council. Available from: <http://www.securitycouncilreport.org/atf/cf/%7B65BFCF9B-6D27-4E9C-8CD3-CF6E4FF96FF9%7D/s_2014_879.pdf> [Accessed 1 June 2015]. For more information see African Union. 2015. Common African Position on the UN Review of Peace Operations, PSC/PR/2(DII). African Union. 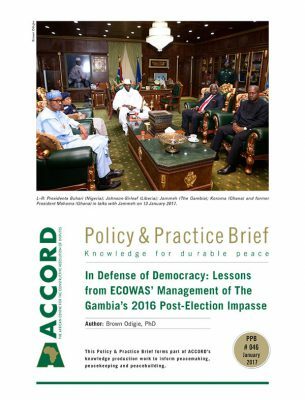 Available from: <http://peaceau.org/en/article/the-common-african-position-on-the-un-review-of-peace-operations> [Accessed 1 June 2015]. Chesterman, S., Ignatieff, M. and Thakur, R. 2005. eds. Making states work: State failure and the crisis of governance. Tokyo, United Nations University Press. p. 365. African Centre for the Constructive Resolution of Disputes. 2014. Op. cit. This resolution, passed on 30 December 2005, along with UN Security Council Resolution 1645 established the UN Peacebuilding Commission.